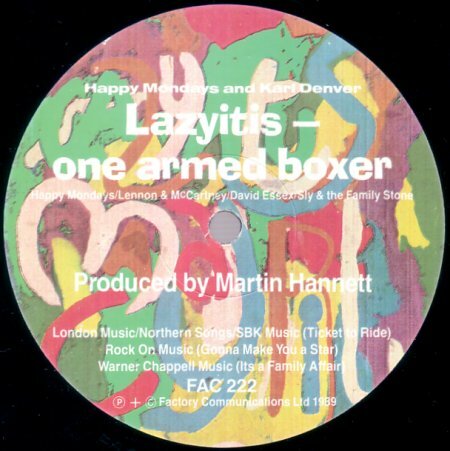 HAPPY MONDAYS &AMP; KARL 'WIMOWEH' DENVER TEAM UP AND MAKE ECCENTRIC BUT INFECTIOUS RECORD : "LAZYITIS"
Happy Mondays, Factory Records' second group have been busy of late. They have polished their live work and now sell out venues like the Town and Country, and Kilburn's National Ballroom. Their latest singIe "Lazyitis" features the unigue vocals of Karl Denver who in the early 1960's achieved great chart success with 11 UK Chart placings, one of which was his nost famous hlt 'Wimoweh' which is still eagerly awaited at every live performance. Future Happy Mondays projects feature a single written and produced by themselves & Erasure's Vince Clarke. Also coming this summer will be a release from Karl Denver, Factory Records' latest signing. There is even talk of a new updated version of the great "Wimoweh", incorporating the new technology of the late B0's. 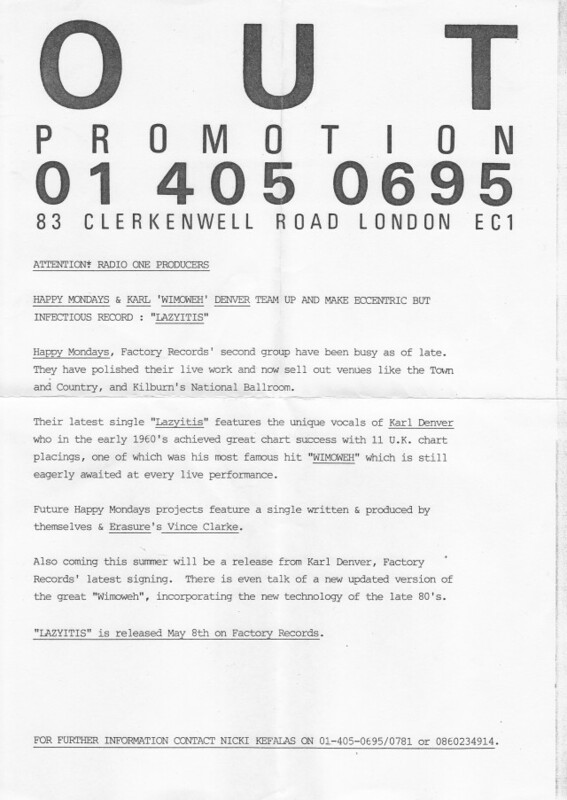 "LAZYITIS" is released May 8th on Factory Records. The song 'Lazyitis' is in the style of a tradtional round.